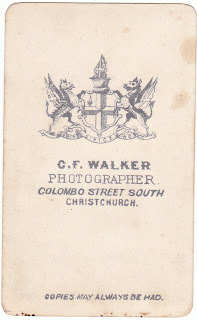 Early New Zealand Photographers: WALKER, Charles F.
Dissolving Views. — Mr. Smith's exhibition in the Town Hall last night of dissolving views by means of the lime light was very well patronised. 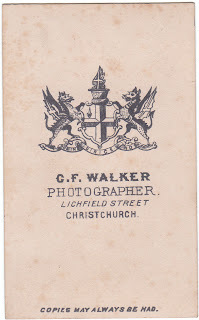 The chief attraction seemed to be a number of views of Christchurch and Lyttelton, photographed by Mr. Walker, of Lichfield street. These views are enlarged to a diameter of twelve feet, and at this large size show to the greatest perfection. 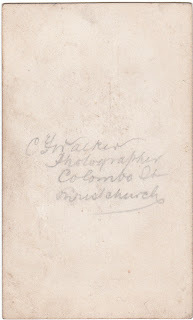 We hear that Mr. Walker has taken some views of Christchurch, which are intended to be sent to the Polytechnic Institution, London, for exhibition. 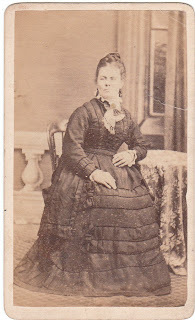 The entertainment last night passed off capitally, and many of the scenes were loudly applauded. The exhibition will be repeated to-night, and we hope with equal success. The first Horticultural Exhibition of this season took place yesterday in the Volunteer Drill-shed, and was well patronised by the public ... Turning to the right, the eye met a various assortment of greenhouse plants and conifers, until the vegetable productions met the view. 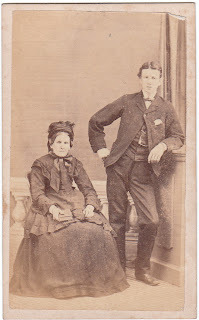 This vista formed one of the most interesting sights, and was well taken advantage of by Mr. Walker, photographer, who took views of the exhibition from various points. 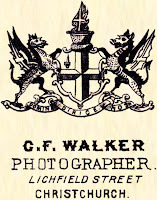 Wise's Directory shows C. F. Walker at Lichfield Street in 1872-73 and at Colombo Street in 1875-76. 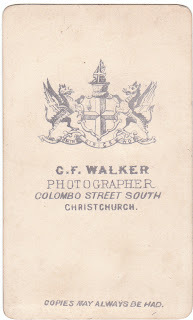 Archives New Zealand - Christchurch, have Official Assignee's Bankruptcy files for Charles Frederick Walker - dated 13.11.1889.
above - a carte de visite taken at the studio of C. F. Walker in Lichfield Street. 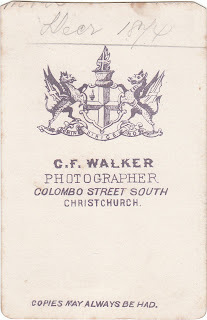 Later the studio moved to Colombo Street. Before the site of one fire has been rebuilt upon, the centre of Christchurch has again suffered severely from the devastating element. Only about six weeks have elapsed since four or five shops in High street were destroyed, and it is now to be recorded that Colombo street, in the very heart of the city, has had a serious gap made in its row of shops. 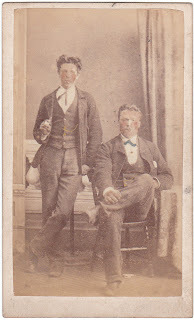 On the present occasion the fire was first observed in the rear of Mr Tremayne's fruit shop and Messrs Peacock and Toomer's boot manufactory. The flames spread with great rapidity. 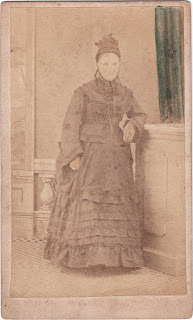 The buildings in danger on the south side were those occupied by Mr Cooper, tailor, Mr Ravenhill, grocer, and Mr Thompkins, tinsmith, after which, Lichfield street cut off the communication southwards. These buildings were all of timber, and very inflammable. On the north side the buildings in danger were a greengocery (sic) store and a grocer's shop, occupied by Mrs Atack, which are comparatively new buildings on the site of an old fire, and built with corrugated iron walls and roofs. 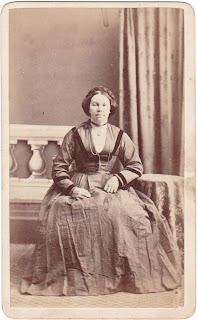 Next to them, in a northerly direction, was Mr Withey's house and shop, built of brick. 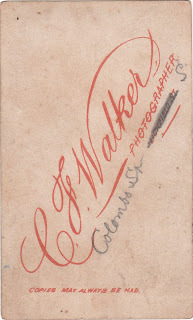 In rear of the buildings there was a small cottage occupied by a Mrs Rice, and then a right-of-way, on the other side of which Mr Walker's photographic studio formed the first of a block of buildings. It will thus be seen that the fire, under ordinary circumstances, was from the first confined to about six six (sic) shops. The hand engine Dreadnought was first to appear, and was placed in position at, the Matheson's agency tank with one hose to the rear of the buildings. The hook and ladder plant soon after their positions, the Extinguisher at the Cathedral square tank, and the Deluge at Matheson's agency tank with fair promptitude. The two latter engines were not brought into play so quickly as they have been on some occasions, but still the delay was not very great. The Deluge was the first to commence pumping, and, to the credit of the engineer, it should be said that he had the water before the branch was fixed. By the time the three engines had got into play, eight buildings were on fire. The fire burned with unusual fierceness, on account of the age and dry state of the timber buildings, and within half-an-hour it was practically over. The whole of the premises particularised as within the boundaries named were totally destroyed, but were partially insured. The total damage may be estimated at from L3OOO to L4OOO. 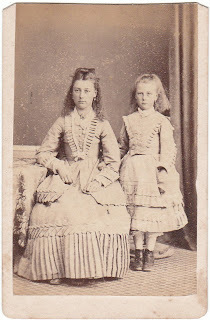 Grey River Argus, Volume XII, Issue 1421, 19 February 1873, Page 3 and 4.